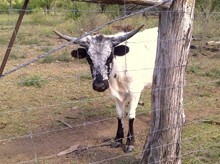 Horns that reach out past 66", excellent producer with strong Bulter names in her pedigree. Katz Meow, CLASSIC, LADY BUTLER.... 2010 MC BRIDES PRIDE heifer at side and bred back the same way. SOLD! 65 INCH T2T BEAUTY-- BUTLER INFLUENCE -- MAN'O WAR OVER KATZ MEOW=ENCINO MAN ON TOP WITH SHOT OF SUPERIOR AND LADY BUTLER ON THE BOTTOM. BRED TO BOOMERIFFIC THE BIGGEST HORN SON OF BOOMERANG CP. NEW TO THE HERD--PICKED HER UP VIA RED MC COMBS SALE. STILL WAITING FOR PAPERS.